When most people think of Costa Rica, they picture white-sand beaches, rainforests, monkeys frolicking in the trees, and clear-blue ocean. And that’s all true. This little tropical country is full of natural beauty. But go inland, in the mountainous region known as the Central Valley, and you have the center of government, culture, and commerce. It’s the capital of Costa Rica, San José. The metro area, known locally as the Gran Area Metropolitana, has a population of about 1.5 million. 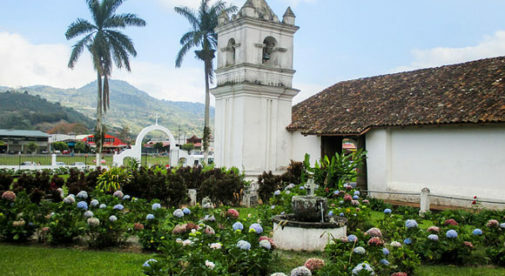 And while most expats don’t live in San José because of the traffic and urban sprawl, it definitely is worth a visit. As the most populated region and largest city in the country, you find opportunities for shopping, dining, and entertainment, as well as cultural events, found nowhere else in the country. San José, with many good jobs available among the many local and multinational companies based there, has a growing middle class. And there are plenty of services catering to those families. In the metro area, you have a wide variety of restaurants, from gourmet to casual, featuring local and international cuisine (from Indian to Chinese), and even well-known American chains. This is a selection you just won’t find in Costa Rica’s rural areas. For this reason, many expats living in the surrounding Central Valley region enjoy trips into San José to have a nice dinner…and sometimes they stay to watch a movie. In San José, you will also find many multiplex movie theaters—modern facilities rivaling any you’ll find in the U.S. They show movies in 3D, and there even IMAX theaters. All the new releases are here, and in English. Best of all, the price is about half or a third of what you’ll pay in the U.S. In downtown San José you can experience a more traditional type of shopping at the Mercado Central. Although you will find North American-style shopping malls with plenty of shops from big name brands on the outskirts of San José you have a more traditional shopping experience awaiting you downtown. The maze-like Mercado Central is an indoor/outdoor market covering several blocks just off the Paseo Colon, a wide avenue that cuts through the center of the heart of the city. In the Mercado you can buy just about anything: flowers, pots and pans, fruits, veggies, pet food, coffee, clothes, electronics…the list goes on. And the prices are cheap. A special treat is to have lunch at one of the small restaurants inside the market. These sodas have traditional foods like olla de carne (beef soup), ceviche, and the national dish, the casado (rice, black beans, salad, and your choice of fish, pork, chicken, or beef). Expect to pay about $5 a plate and wash it down with fresh fruit juice. Nicknamed the “Lungs of San José,” La Sabana is a vast park just outside the main downtown shopping district. Formerly the site of the international airport, it is now home to walking trails, performance venues, baseball and soccer fields, basketball courts, the National Stadium (home to concerts and soccer games), and grassy meadows. A forest of tall trees provide plenty of shady picnic spots. It’s a favorite of families on the weekends, with vendors offering pony rides and other amusements. Young couples stroll arm and arm any day of the week. In Costa Rica’s beach towns you’ll find live music, but it’s the homegrown variety and more often than not reggae, classic rock, Jimmy Buffet covers, or a similar beach-friendly style. In more rural farming communities, Latin music styles like salsa and bachata are popular among locals. Only in San José will you find a selection of more “high-brow” genres like classical, opera, and jazz. The two premier venues are the National Theater (Teatro Nacional) and the Jazz Café. The National Theater is a historic building done up like a European opera house and has daily concerts of string quartets, operas, classical guitar players, or full orchestras. Tickets are as low as $10 for some performances. Over at the Jazz Café, which has locations in the hip neighborhood of San Pedro and the well-heeled suburb of Escazu you have regular performances of jazz, funk, and blues from local, as well as artists from overseas. San José’s Barrio Chino may not rival that of London or New York City. But it is the place to get the best dim sum and other traditional Chinese foods in Costa Rica. The neighborhood, covering about 10 blocks downtown just off the main avenue Paseo Colon, was started by the Chinese immigrants who first came to Costa Rica 100 years ago. And it is well-supported by the Chinese government today. It also has Asian food stores and hosts festivals throughout the year.